Heading into game 5 of both series, we already know what teams are superior in quality. The question is can there something to negate that advantage? The Brooklyn Nets aren’t very high on confidence as they travel to play the Miami Heat, hoping to avoid elimination, while the San Antonio Spurs might be facing a little bit stronger competition from the Portland Trail Blazers than what we’ve seen so far. The Nets are still reeling from the 49 point performance by LeBron James, but it is worth mentioning this wasn’t a devastating win. The Heat only pulled away for good thanks to a big three pointer from Chris Bosh late in the game. The Nets didn’t exactly get a lot done with their defense on the ‘other guys’ but James pretty much took it upon himself to finish off the game. Even with an almost 50-point effort, the less hot the ‘other guys’ gets, the better it is for the Nets. But things have been difficult for them in Miami this series. It’s been difficult for them not getting three days of rest between games and the fumes of experience and talent are running out. The bottom line so far in this series has been for Brooklyn – if you can’t make 3’s, you’re going to lose, so they remain dependant on the kind of day Joe Johnson and Paul Pierce have, hoping to get a little bit of extra from Mirza Teletovic unlike the previous game. Defense makes things happen, and the Heat have been doing it very well so far. Chris Bosh has been phenomenal, Mario Chalmers should probably spend more minutes on the floor and LeBron James, when he feels like it, can make life miserable for anyone he’s guarding. The Nets need to find a way to slow down James. Be it using smaller guys like Deron Williams on him or trying out Joe Johnson for longer stretches, Paul Pierce is clearly not the man to do it. Should the Spurs be worried about their performance in game 4? Probably not, but you never know. It only takes on good game for a team to suddenly believe that everything bad that happened to them is in the past. As the old saying goes, everything begins with defense, and the solid performance from Nicolas Batum and Robin Lopez against a team they didn’t know how to handle resulted in an impressive win. The key for Portland is the first quarter. The Spurs won by blowing them out early on. Focus from Damian Lillard which means not rushing his shots and not trying to prove he can outplay Tony Parker should work quite well. 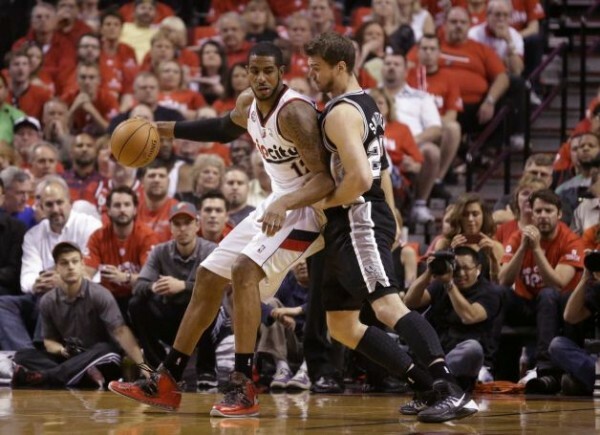 Trying to establish a rhythm in the paint through Lopez and Aldridge might benefit them later on, but no matter how you try to look at it, it’s going to be a big surprise if the Blazers don’t begin their summer vacation after game 5.